Home for a Viking - The 48" range and a full depth refrigerator was on the "must have" list and nobody has a design they liked, so we had to get creative in this kitchen renovation for this Family. The obstacle was a chimney in the middle of the room, which made the room very narrow. We ended up recessing it into the wall and claiming some space from the adjoining family room. 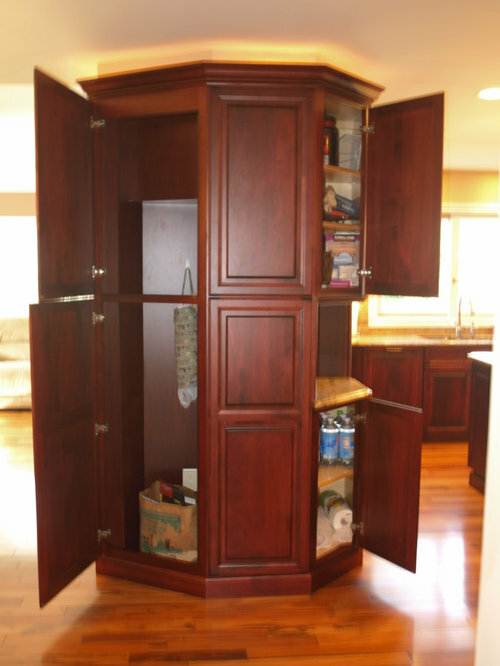 We created a custom corner cabinet that transitioned from a 24' to a 12" - "one of a kind" said Robin, the designer of this custom cabinetry. This kitchen wraps around from the kitchen into the dining area, like a chameleon the chimney is encapsulated behind what looks like just paneling but is really hidden storage. At the touch of a button hidden access panels are revealed and inside is tall storage and room for hidden treasures. 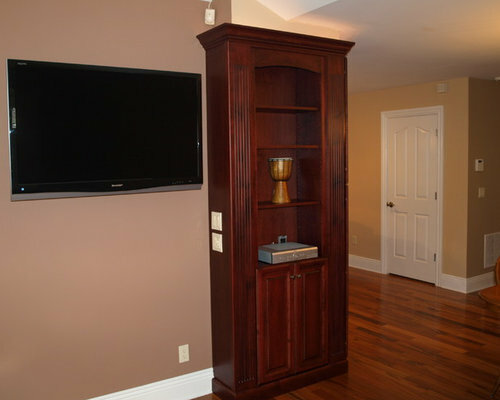 Completing the run is a built-in entertainment center ready to house collectables, video and music equipment. 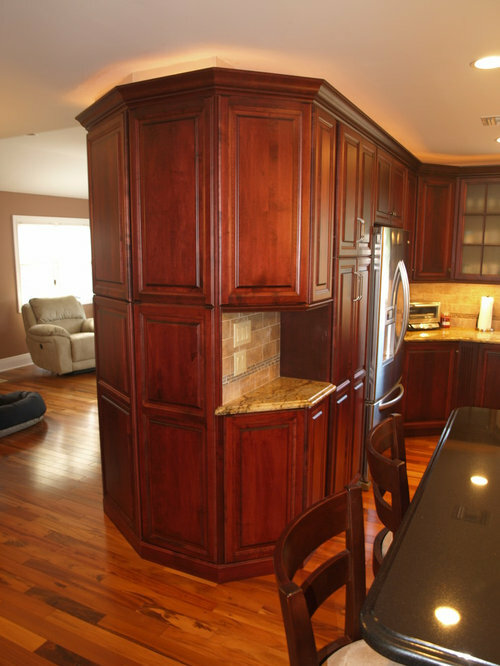 Pat refers to this as the "8th Wonder" as one of the lead cabinet installers told her it was the most complex and spectacular cabinetry he had installed. 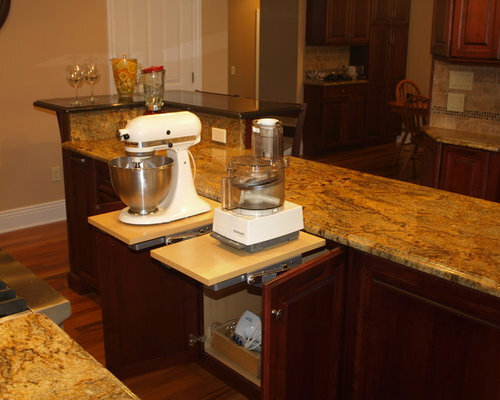 As you walk through the kitchen you will find nearly every feature any chef could want including pop up stand for the food processor as well as taking advantage of the KitchenAid mixer which pops right up to counter height plugged in ready to roll. Hidden at the end of the island is the drawer microwave a great new appliance located right by the built-in refrigerator, making reheating easy and safe. The tile backsplash was designed by Sergio at Standard tile and really makes a statement with the beautiful mosaic behind that Professional 48" Viking. This kitchen shows multiple unique features. 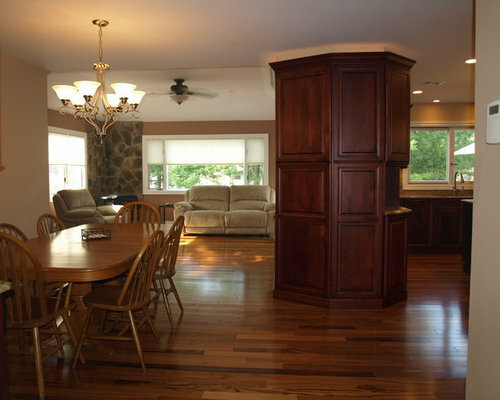 A two-tier island allows for a variety of postures and gatherings. The wine cubbies for the quick access reds, a wine cooler to keep the whites at the perfect temperature. Want to make a statement? the kitchen counter top is the perfect place to do so. 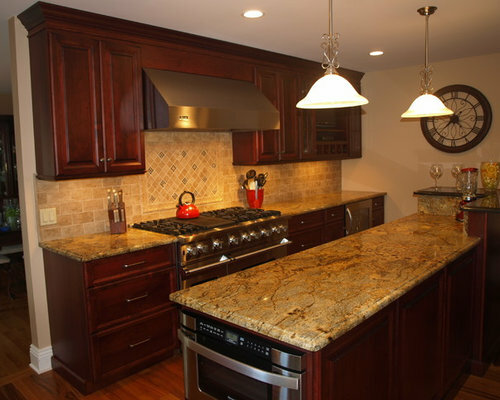 This 1/4" Golden Crystal Everest Marble fills this kitchen with so much movement and sophistication. 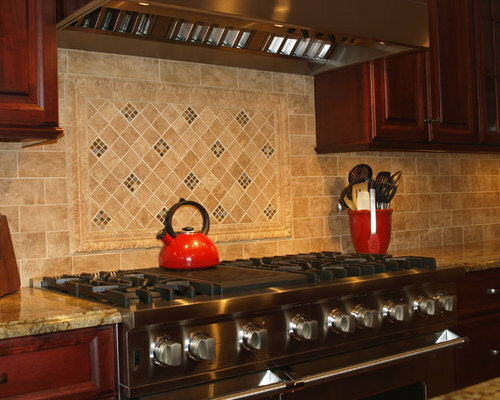 Fill the space between your new range and hood with a simple mosaic design framed in pencil. Not dramatic enough for you? feel free to get creative. Traditional at its finest. 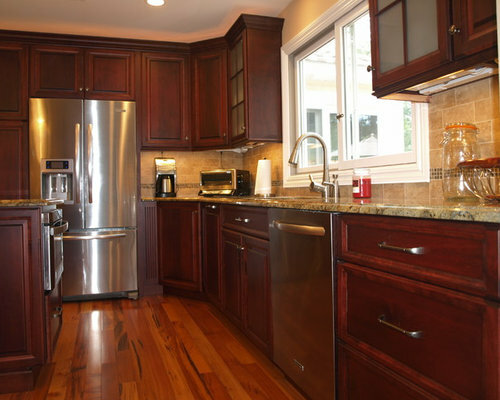 Maple Cabinets with a stained rosewood finish, travertine back splash, stainless steel appliances, and a large window above the sink. 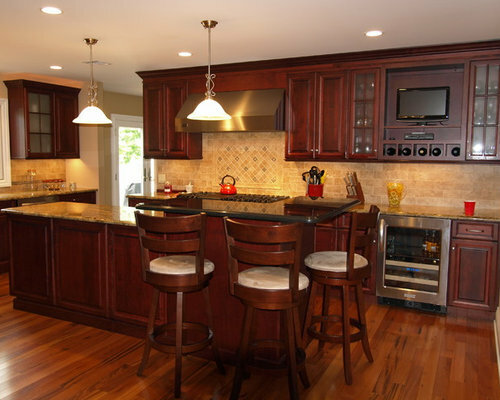 In a world of all white and grey cabinetry, don't be afraid to go dark. 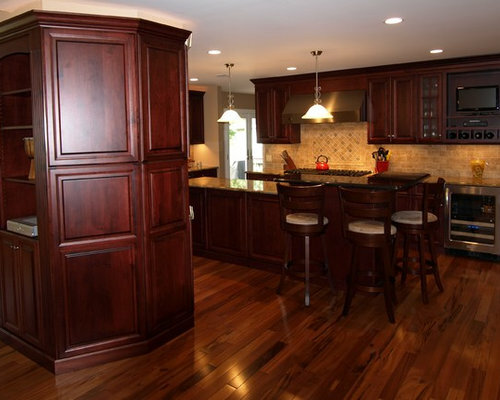 These Maple cabinets stained to rose wood create a timeless design. 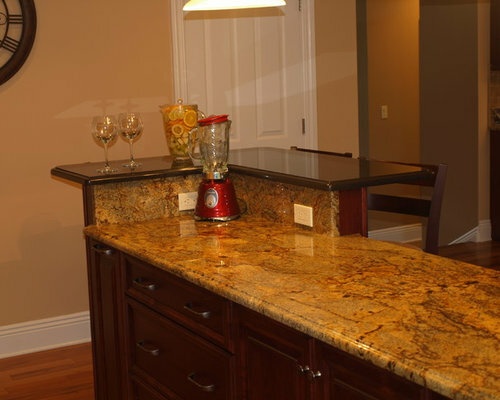 1/4" Golden Crystal Everest Marble with a ogee edge fills this kitchen with so much movement and sophistication. This kitchen shows multiple unique features a two-tier island allows for a variety of postures and gatherings. Under-mount sinks are clean and sleek. 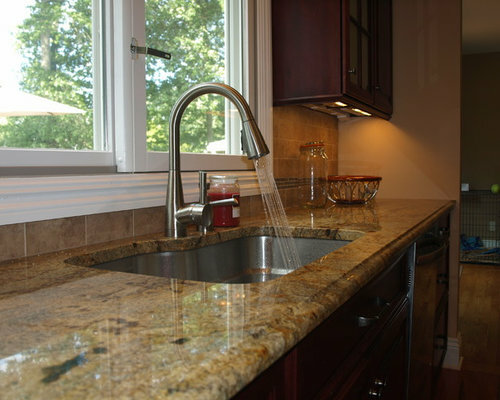 No sink lip to trap water or counter left overs only a clean cut polished edge.. 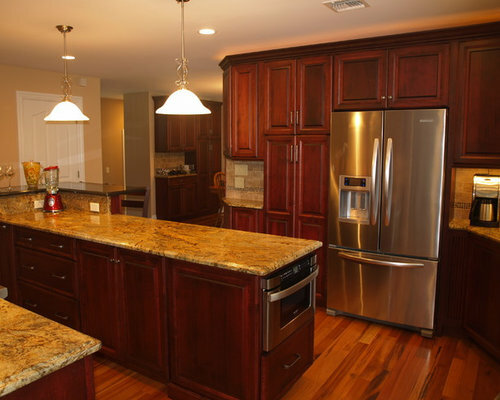 There are tons of storage options when it comes to kitchens. 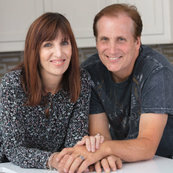 Design a Kitchen that is made specifically for the way you work. 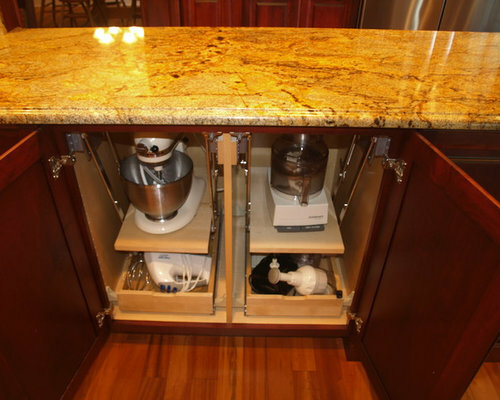 These pull out shelves create a place for some of larger counter top items, keeping the kitchen clean and allowing for an ease of accessibility. Your home represents you, your personality. It is a place to live and love. This home and all its wood tones and natural colors, creates a warm inviting atmosphere. Storage storage storage, that is one thing you cant get enough of. A custom closet that fits all your things might be what you need. Storage storage storage, that is one thing you cant get enough of. A custom storage unit that fits all your things might be just what you need.